Imagine dining out and being able to choose from 25 varieties of gluten-free pizza. Hold that thought until June 29. 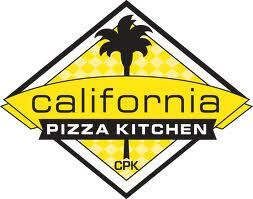 That's when the California Pizza Kitchen chain will begin offering gluten-free pizza nationwide. (Local outlets are in Philadelphia on City Line Avenue, and at the King of Prussia Mall, Plymouth Meeting Mall, Cherry Hill Mall and Christiana Mall in Delaware.) The company has been test-marketing the new crust in Alabama, where only five pizza options aren't gluten-free because of gluten in other ingredients: Jamaican Jerk Chicken, Tostada, Thai Chicken, Roasted Garlic Chicken and Artichoke & Spinach. I'm told that the gluten-free versions are made using separate ingredients and on dedicated pans to avoid cross-contamination. At least in the test-marketing phase (and hopefully for the nationwide roll-out), diners do not incur an extra charge for the gluten-free crusts. There's a email-list option on CPK's homepage that gets you a $5-off coupon. Several Lamberti's-owned restaurants in the tri-state area have gluten-free choices. Tutti Toscani in Cherry Hill (1491 Brace Rd., 856-354-1157) serves pasta, while the menus at Lamberti's Italian Grill & Bar in north Wilmington (514 Philadelphia Pike, 302-762-9094) note acceptable options. Several readers have mentioned that Lamberti's Cucina in Feasterville (1045 Street Rd., 215-355-6266) can accommodate special dietary requests. Christine's, an Italian BYOB in Yardley (385 Oxford Valley Rd., 215-369-2930, has gluten-free penne and fusilli pasta. Gluten-free pasta also is available at Katie O'Donnell's in Northeast Philly (4501 Woodhaven Rd., 215-637-5151). The gluten-free menu from The Broad Axe Tavern (901 W. Butler Pike, 215-643-6300) is now posted at the Gluten Free Philly Restaurants page. BRE Bakery in Warminster (700 York Rd., 215-821-8462) is carrying baking mixes from recipes created by Mr. Ritt's. The mixes, which are free of gluten, dairy and egg, include Quinoa Bread and Soft Pretzel Mix, Italian Baguette/Pizza Crust Mix and Buckwheat Bread Mix. Dock Street Brewing Company in West Philadelphia (701 S. 50th St., 215-726-2337) once again has its gluten-free Sudan Grass Ale on tap. Thank to reader Vic B. for the tip. Campbell's Place in Chestnut Hill (8337 Germantown Ave., 215-242-1818) serves Redbridge beer and Magner's hard cider. Kids have more gluten-free choices when visiting area museums and amusement parks. The DEcafe at the Delaware Children's Museum in Wilmington (550 Justison St., 302-654-2340) serves Wellshire Farms' gluten-free chicken bites, which are baked and prepared separately. Dorney Park in Allentown (3830 Dorney Park Rd., 610-395-3724) has posted a gluten-free food list at its website, while a customer-relations rep at New Jersey's Six Flags Great Adventure (1 Six Flags Blvd., 732-928-1821) let me know that gluten-free food can be purchased at Carnegie Deli (chicken salad, garden salad), Best of the West (grilled chicken sandwich without the bun) and Panda Express (Smiley fries). Fresh fruit is available at Carnegie Deli, Granny’s Country Chicken, Best of the West and Yummy Yummy Café. My latest snack-food addiction? 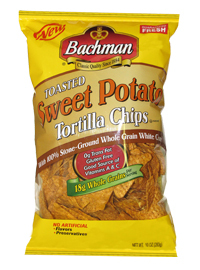 Bachman's Toasted Sweet Potato Tortilla Chips. Go get them. Now. Rita's newest water ice flavor is Juicy Pear Ice, and it's gluten free. I'm looking forward to trying that one. The Gluten-Free Philadelphia Supper Club's next get-together won't be dinner, but brunch instead. Food For All Market in the Mt. Airy section of Philadelphia will host the group on Saturday, June 11 at 1 p.m. Gluten-free waffles, sandwiches, soups and salads will be available. For more information about the club or plans for the brunch, e-mail reader Adriana Z.